Mare ridges in Oceanus Procellarum at the northwest tip of the Aristarchus plateau (lower right) are typical of mare ridges in many other areas. 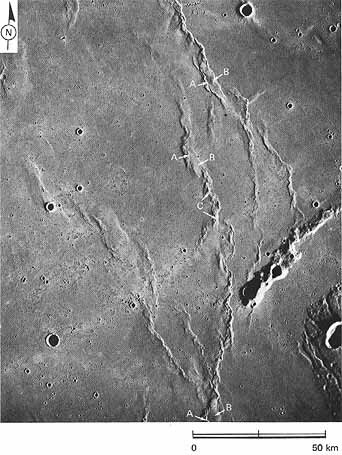 Among these are small crenulate wrinkle ridges (A) superposed on broad gentle arches (B), braided or en echelon patterns, a common tendency toward parallelism within limited areas, and a tendency to be deflected by obstacles such as the arcuate ridge belt of terra near the Aristarchus plateau. 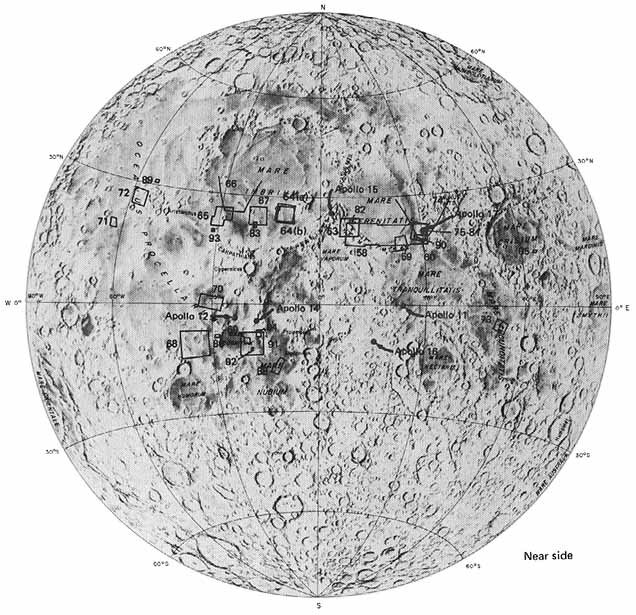 Measurements by photogrammetric methods have shown that mare ridges may project as much as 250 m (at C) above the surrounding mare surface. The origin of the ridges has yet to be explained satisfactorily by any single hypothesis. Among those proposed are (1) intrusion of deep-seated, postmare dikes and laccoliths, with some extrusion; (2) compressional buckling caused by sagging of comical mare surfaces; (3) buckling at the fronts of lava flows; (4) autointrusion of molten subcrustal mare lava forming laccoliths and squeeze-ups; (5) thrust faulting; and (6) drag folding along deep-seated transcurrent faults. The diversity in morphologies and patterns of ridges suggests that several hypotheses may be required to explain all of them. -C.A.H.